The Parker "Slimfold" began life in 1958 as part of the "British Duofold" range of pens offering a small and slim option to the range. 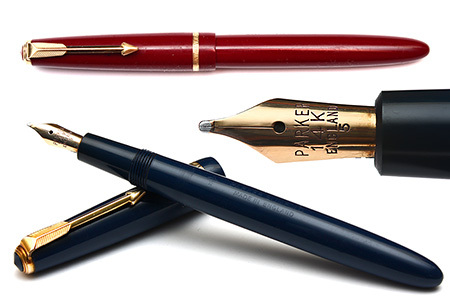 As with all of this family of pens it was available in Black, Blue, Green and Red. Early Slimfolds were stamped "Parker Slimfold Made In England" on the barrel making identification relatively easy. Later models had the model name chalked on which, once rubbed off, made them harder to identify. Early ones had 14k gold nibs, the earliest ones marked with an N to denote the Parker Factory in England. The N was soon dropped and replaced with the number 5 to identify the nib as a Slimfold nib. Earlier ones also sometimes had a second number to denote the year of manufacture. The early Mk1 Slimfolds measure in at 113mm from the rounded barrel end to the end of the nib, or 125mm from end to end with the cap on. Early pens had a cap with a gold plated short length feathered arrow and a gold plated cap band with a chevron pattern engraved into it as well as a small plastic jewel screwed into the cap top to match the main pen colour. 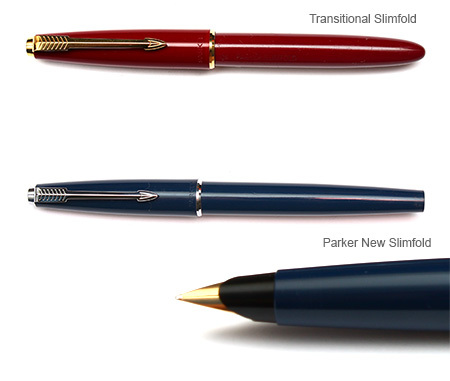 These transitional models lasted until 1971 when the whole pen was given a make over to become the "New Parker Slimfold" or "Parker Slimfold MK II", utilising not only the cap from the Parker 45 but also the nib and filling system. From a collecting point of view the Parker Slimfold never quite managed to gather much interest so tends to sell for bargain prices. They tend to be good writers for those who like smaller pens and provided that the aero-metric filling system is fully working. As always pristine ones sell better then venerable old work horses.